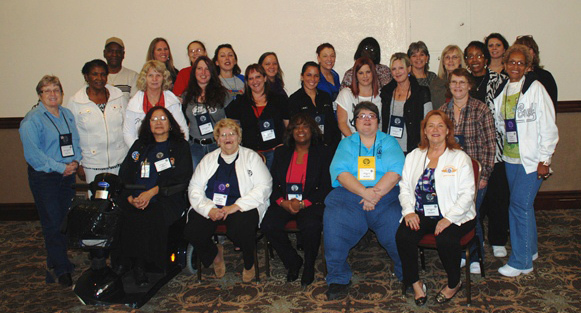 IAM General Vice President and Coalition of Labor Union Women (CLUW) National Vice President Diane Babineaux, front center in red, led a delegation of IAM women to the 17th Biennial CLUW Convention in Reno, NV. IAM General Vice President Diane Babineaux, serving as one of CLUW’s National Vice Presidents, led a delegation of 41 IAM women. Speakers included AFL-CIO President Rich Trumka, who sent greetings via video. He encouraged the attendees to stand proud as representatives of labor and to continue inspiring the younger generation of labor women. Distinguished panels of union women discussed the future of unions, strengthening the women’s labor movement, how to assist younger women in union and CLUW activities and what seasoned workers can learn from the younger generation. One convention highlight was a showing of the film Union Women Union Power: From the Shopfloor to the Streets. The film highlights five rank-and-file union women from different sectors across Philadelphia, introducing their lives and fights for democracy in the workplace. Members of the CLUW Young Women’s Committee conducted the film’s interviews with the labor women in an effort to spur intergenerational conversation in the women’s labor movement. Dina Yarmus, co-director of the project and Chair of the Young Women’s Committee of the Philadelphia CLUW Chapter, introduced the 30-minute film. CLUW, a national women’s organization within the labor movement based in Washington, DC with chapters throughout the country, was founded in 1974. The organization is leading the effort to empower women in the workplace, advance women in their unions, encourage political and legislative involvement, organize women and promote policies that support women and working families. To learn more about CLUW, visit their website at www.cluw.org.